Not that long ago, behind seven tiles and seven drops, there was a giant eye. It used to show up only amid the steam of a colorful bathroom. Until one day a boy called Luka spot it. After exchanging couple of penetrating gazes, they became best friends. Today, they open all the doors together and do judo. Sometimes they blush, they lift the curtain and hold their horses, when needed. That was the missing perspective. Luka named it Gugadzina. The story about the Gugadzina brand begins in the fantasy world. Where kids’ imagination puts things into their own perspective. 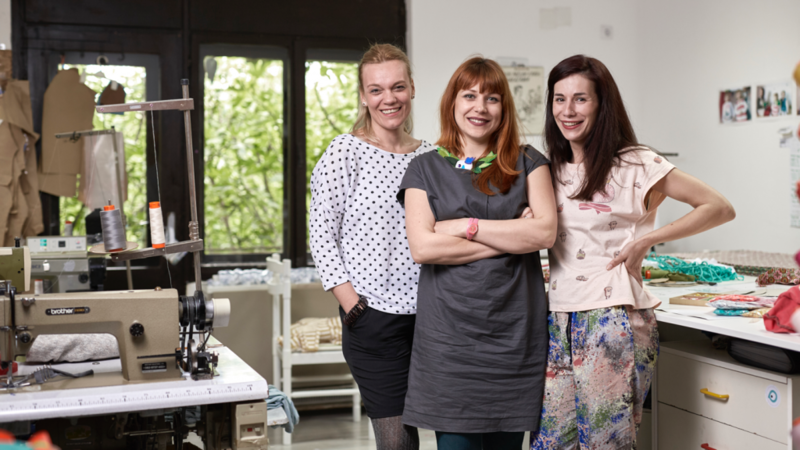 Three mums from Belgrade, a ceramist, a costume designer and an economist created Gugadzina brand because they wanted their kids to grow up and dress like Kids. With everything that makes and takes up their world – from motifs, heroes, forms and colors to comfort, natural materials and quality. Listening carefully to their kids, that was exactly what they accomplished. They design a lot, but in small quantities, giving every kid an opportunity to live in their own world. Where they could feel special. Far from the large-scale clothes production, Gugadzina exists in an infinite chain of creativity. With a healthy and human approach to things that surround us. They have already won their place in the Serbian market, focusing on original, unique and comprehensive. Finally, their discourse is clear and it exceeds the boundaries and questions a lot of perspectives.